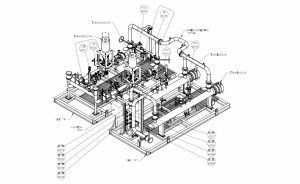 Hot Oil Package with Electric Process Heater (3D Drawing). Test your knowledge of electrical, mechanical and process engineering for Electric Process Heaters (EHPs) by answering the questions below. If you know most of the answers to these questions, you should feel confident in evaluating an EPH. If not, you may want to form a team of qualified engineers to evaluate the EPH. Or you may want to send the process, electrical and mechanical information to an EPH manufacturer (like IFS) and let them help to find a solution. 1. What are the differences between stepper, stepper/ SCR and full SCR controls? Full SCR (silicon-controlled rectifier) controls will have an SCR on the main circuit or each subcircuit. Stepper controls do not have an SCR and are controlled by turning the main circuit on and off or by turning each of the subcircuits on and off as more or less heat is required. Stepper/SCR controls use on/off control for most of the subcircuits and SCR controls on the remaining one or two subcircuits. 2. KAIC is the abbreviation for what, and how does it apply to EPHs? KAIC stands for kilo-amps-inrush current. It is the amount of current available to inrush to a circuit or subcircuit when there is a downstream short circuit. 3. Do over-temperature controllers on EPHs always work? Over-temperature controllers do not always work .There are two failure scenarios: 1) if one of the subcircuit magnetic contactors were fused closed or the over-temperature thermocouple was not installed on the correct overheating circuit, or 2) if two EPHs were connected in series or parallel and the over-temperature thermocouples were mistakenly installed with wires crossed. 4. Is it necessary to coordinate electrical components (main circuit breaker, subcircuit breaker, submagnetic contactors and fuses)? Each electrical component has an amp vs time curve. However, it is difficult to evaluate each scenario of failure. It is more important to have a preventative maintenance program that regularly checks the components, especially after an electrical upset. 5. When are EPH standoff housings used and why? Standoff housings are used when the process heat can raise the temperature of the electrical terminal housing. The wire in the housing must be rated above the housing temperature. To avoid expensive, high-temperature wire, the electrical terminal housing can be extended away from the process heater flange. 6. What is a heat transfer coefficient and how does it vary with flow rate? The heat transfer coefficient is an empirical number that can be estimated and used to calculate the heater’s sheath temperature. The sheath temperature is the temperature at the metal-to-process interface. A higher flow rate will increase the heat transfer coefficient and lower the sheath temperature. As flow rate decreases, the sheath temperature increases exponentially. Generally, the EPH is sized to take advantage of turbulent flow. Once the flow decreases from turbulent to laminar, there is a step-change jump in sheath temperature. The temperature then continues to increase exponentially with a decrease of flow rate. 7. Is film temperature calculated at the boundary layer or the metal-to­ process interface? The film temperature is the boundary layer temperature. This is an important distinction in hot oil heaters. Manufacturers of hot oil may incorrectly call the metal-to-process interface temperature the film temperature. If applied incorrectly, the EPH will “cook” the hot oil due to film temperatures exceeding the maximum allowable by the hot oil manufacturer. 8. What are LMTD and fouling factor, and do they apply to EPHs? LMTD stands for log mean temperature difference and does not apply to EPHs. The heat from an EPH is going into the process. The important question is, how hot is the EPH sheath temperature? (See answer to question 10.) Fouling factor also does not apply to EPHs, because if fouling occurs, the heat still goes into the process. If the fouling causes hotter sheath temperature and more fouling occurs, then the EPH has been improperly designed or selected for the application. Usually this means the heat flux is too high for the process. 9. Do baffles on EPHs create “dead zones?” Yes, baffles create dead zones, or areas of no flow immediately behind the baffle. Designing EPHs with baffles is more of an art than a science. Two modes of heat transfer can cool the elements behind the baffles. One is forced convection due to eddy currents in the fluid and the other is radiation. 10. What is the max/min allowable EPH sheath temperature for heating fuel gas? Some customers ask for the EPH sheath temperature to be 80% of the auto-ignition temperature of the fuel gas. This would be a good design criterion if there were oxygen in the fuel gas. Since oxygen is almost never present in fuel gas, a good rule of thumb is to keep the EPH sheath temperature no more than 100°F to 200°F above the process temperature for all process conditions. 11. At what temperature does the stress value of S4·106B carbon steel begin to drop? Most EPH shells are made from pipe. In a no-flow situation, the over-temperature controller (OTC) is designed to sense the elevated temperature and turn off or reduce power to the EPH. If the OTC fails, the EPH will continue adding heat to the process which will increase the temperature of the shell. Eventually, the material stress value will decrease with temperature. If the EPH is under pressure and the shell can no longer contain the pressure of the process fluid, the shell will rupture. The process will flow to the atmosphere and, if inflammable, may ignite. A properly designed over-temperature controller and a recommended low flow switch will avoid this situation. 12. Why does the on/off control on an EPH shorten the life due to thermal stresses? On/off control or stepper control causes the EPH elements to turn full-on and heat up, then turn full-off and cool down. The result is the elements’ expansion and contraction. Each time it expands and contracts, the thin wire inside the heating element weakens. Using a full SCR control will keep the EPH at an even temperature and will increase the life of the heater. 13. Why do most EPHs receive a safety factor of 0.85 without X-ray? According to ASME code Section VIII, when using pipe for a pressure vessel shell, a 0.85 safety factor can be used instead of the normal 0.7 safety factor. Since most EPHs are made with pipe shells, spot X-ray will increase the safety factor to 1.0 and allow less wall thickness. 14. What is the maximum temperature for using carbon steel, stainless steel (H-grade and L-grade) and Chromoly? The maximum temperature for carbon steel SA-106B is 850°F, for L-grade stainless steel is1,000°F and for Chromoly is 1,150°F. The maximum temperature for H­grade stainless steel is only limited by its stress value. 15. What are EPH standard wall thicknesses on elements? EPH elements are made from swedged tubing. Depending on the manufacturer, the EPH tubing wall thickness is based on the tubing used. 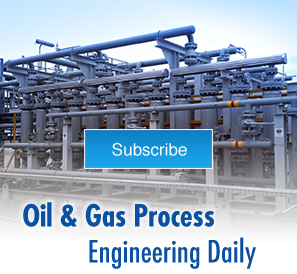 Generally, code calculations are not required on EPH elements or the process flange. IFS Technical Specification for Industrial Grade Electric Process Heaters (IFS-607A rev.8) includes many safety features that are built in. All IFS EPHs meet the relevant codes and standards of ASME, ANSI, NACE, NFPA, SSPC, AWS, and OSHA. Download the full IFS-607A rev. 8 Technical Specification for Industrial Process Heaters. Read More about the hot oil package (featuring an industrial grade process heater) IFS built for use in the Gulf of Mexico.